Are you like most marketers who want to get more eyes on their newsletter – and do it with fewer frustrations and fuss? Let me walk you through how Facebook Lead Ads can make it happen. We’ve got another exciting update to share! As you know, our referral program works like this: if you invite a friend who joins GetResponse as a paid customer, you and your friend get a $30 credit added to your account. Want More Webinar Signups? Try our New Landing Pages Feature! 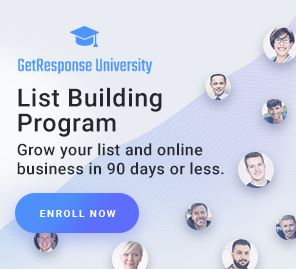 At GetResponse, we’re always busy tweaking the tools you need to build, grow, and scale your business. And we know you’re focused on getting more leads. After all, last year around 85,000 new contacts signed up to our customers’ lists every day. Facebook is one of the biggest source of news on the internet. This makes Facebook even more responsible for what is being shared on the platform. Recently, the social media giant has been working on putting up measures against fake news shared on the site.